[The NAHB Student Chapters program awarded Dr. Scott Kelting Outstanding Educator at an award ceremony held at the 2019 NAHB International Builders’ Show in Las Vegas in February. Sponsored by Cengage Learning, this prestigious award recognizes and encourages high quality standards in teaching construction education. Educators are recognized for their voluntary extracurricular activities, including those with construction industry organizations, as well as their construction experience and professional initiatives. SAN LUIS OBISPO — Cal Poly construction management students garnered four first-place trophies at the Associated Schools of Construction Region 3 Division Competition on Oct. 17. This is the first year that Cal Poly has swept first place in all of the open categories. It is also the sixth year Professor Greg Starzyk has taken at least one team to Downers Grove, IL. to compete in one of the competition’s open categories. "There was something special about all four of this year's teams. They worked so well together that they made the work appear effortless. You could feel the trust and support that they gave to each other, “noted Starzyk. The four teams, consisting of six students each, began practicing in the spring quarter. Because Cal Poly is a quarter school, it is necessary to get such an early start since the Region 3 competition starts on October 17th. Once, classes begin in September, the teams have just under a month to fine tune their skills. ASC Region 3 consists of schools from Illinois, Indiana, Kentucky, Michigan, Ohio and Wisconsin. While there are seven categories open to all ASC Region 3 schools, four of those are open to teams from any ASC school in the nation. The open national categories are Concrete, Electrical, Preconstruction, and Project Solutions. These four categories had 7 teams, 5 teams, 8 teams & 9 teams competing respectively. 4th year construction management student Harrison Woods of the Concrete Team, spent his summer internship preparing for this competition. But preparing can only get you so far. The majority of work takes place on the Thursday of the competition with the teams sequestered in their rooms. Once the deliverables (bid proposals, estimates, schedules, change orders, etc.) are dropped off Thursday night, teams are given until Friday to practice how they will present to the judges. “The greatest challenge is time management. Given that we had more than 24 hours between the assignment of the prompt and the meeting with the judges, most would think that there would be a surplus of time, however, our attempt to understand the project as thoroughly as possible meant every hour was valuable to us,” said 4th year construction management student Arlen Hartoonian, also a member of the Concrete Team. For more information about Cal Poly’s Construction Management Department and to see photos of the winning teams, go to construction.calpoly.edu/content/competitions-and-awards/asc-3. 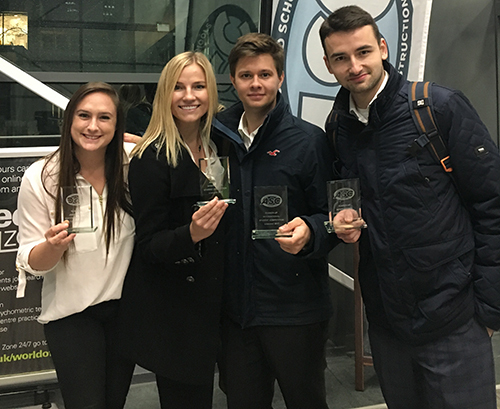 An interdisciplinary team of Cal Poly students earned second place at the 2018 National Association of Home Builders’ (NAHB) Residential Construction Management Competition held Jan. 8-10 in Orlando, Florida. The students, all members of the university’s NAHB student chapter, competed against 33 other university teams, including first-place winner Penn State University, Brigham Young University (third place), and the University of Denver (fourth place). The NAHB Student Competition, a highlight of the International Builders’ Show, charges students with completing a management project/proposal. This year, teams were asked to prepare a proposal to acquire (or decline to acquire) a 72-arce parcel in Okemus, Michigan. The Cal Poly team was led by construction management seniors and team captains Jeremy Suryadi and Jeffrey Hammond. They were joined by architecture students Alexander Gama and Tyler Hall; business finance students Tyler Ingel and Carter Jones; city and regional planning student Eric Martinez; and construction management students Abraham Ahmed, Sarah De Los Reyes, Thomas Fuentez, Trevor Nally and Jeffrey Phunmongkol. The team was advised by construction management faculty members Scott Kelting and Stacy Kolegraff. Please join us in congratulating Kelly Williams for her outstanding presentation to ELECTRI International (the foundation for the National Electrical Contractors Association [NECA]) at their January Council meeting. Our Cal Poly NECA student club submitted a proposal in response to ELECTRI’s Student Community Service Initiative, which promotes the growth of college and university programs to advance the development of efficient and sustainable energy solutions and cultivate the professional development and personal growth of students. Kelly represented Cal Poly well, earning an award of $20,000 for our NECA student club chapter. This award, along with the club's recent fund-raising event, will allow club members to perform student service learning projects in Shell, Ecuador and the Ecuadorian Amazon Rainforest. This past week, Cal Poly CM students Kelly Williams and Carlye Cunningham took part in the ASC Region 8 International Construction competition, placing 2nd out of 11 teams from 11 different Universities and 4 different countries. The two were a part of a joint team with two students from the Czech Technical University in Prague. The competition took place in Liverpool, England at Liverpool John Moores University. The first day of the competition, the team worked for 7 hours on a problem statement for a 6 story hotel tenant improvement project. The next day, the team presented their project in front of a panel of judges. Next the judges deliberated and called back the top 4 teams for 20 minutes of question and answer about the project. After this round, the judges made their decisions and the Cal Poly team was very proud to hear the results. 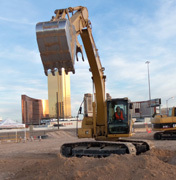 The competition was different than any other ASC competition, connecting construction students from all over the world and challenging them to adapt to the differences between European and American construction.